Think I'm joking? I'm not. I am a member of Christ the King parish in Ann Arbor Michigan, pastored by Fr. Ed Fride. 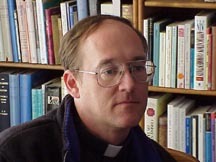 He is the priest that brought our family into the Catholic Church on May 22, 1994. He is a manly, orthodox and charismatic priest. And, our parish now has 21 men in seminary studying to be priests. What is Fr. Ed doing right? I already told you: he is a manly priest who is orthodox, faithful, loyal to the Church, the Pope and Mary and he is charismatic. Some priests and parishes on the "left coast" may want to take notice. Vitality follows those faithful to the Church and the Apostolic Tradition. Those who abandon the teaching of the Church — trying to be hip or trendy — will not find these kind of results. You will see the same thing with convents. Those women who are proud to wear the habit and decry radical feminism and new-age garbage will find their convents full. Those who embrace the stale fads of the 60's and 70's have no new vocations. It is time for people to wake up and smell the coffee. I am proud to be a member of Christ the King parish! I am proud of Fr. Ed and I am proud of Catholics who love the Church, the Sacred Tradition and orthodoxy. There were some videos I had trouble with but they are now all finished and updated. The new one was for Day 11 in Cairo, but I also updated Day 12. Enjoy our September pilgrimage to Israel and Egypt by clicking here. 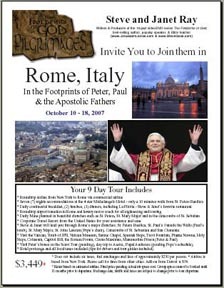 November 2007 Pilgrimage to Israel is Filling Fast!